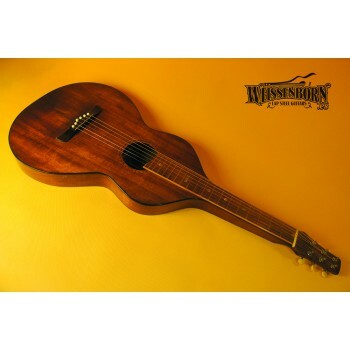 --SOLD--This is a rare and unique pre-production era Weissenborn. 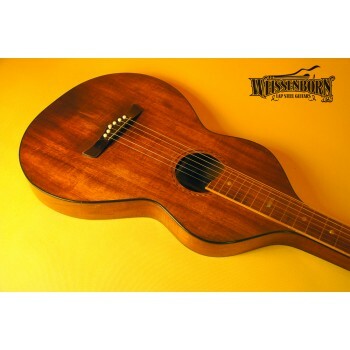 Hermann Weissenborn established the Weissenborn Co. Ltd. in 1923 to mass produce Hawaiian guitars (for his own brand, and others, such as Kona). Before this, he was a violin and piano maker. From 1916 to 1923, apart of repairing pianos and making violins, he started building Hawaiian guitars (already for Kona). The guitars from the production era (1923-1936) feature the inside burned in shield wich was permanent during production (you can also see a couple in our site). 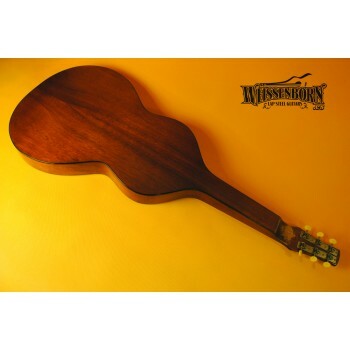 The instruments from the pre-production era featured the Hermann Weissenborn label holding a Hawaiian guitar. Most of these labels were lost or removed by owners (who knows why, some remain still though). Our pre-production has it missing unfortunately, but some rests remain. The model for sale is not a style 2 per se! 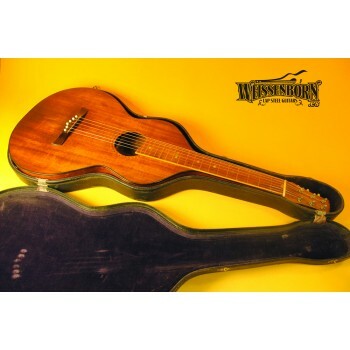 Most of the latest pre-production era Weissenborns (1921-1922) were offered with same specs of what later would be offered as style 2 (same binding in headstock, same black plastic binding, and fretboard work). Hermann Weissenborn didnt offer his guitars in styles until 1923. These models were thinner than production style 2s (production ones were 3" body depth, this one is 2"). 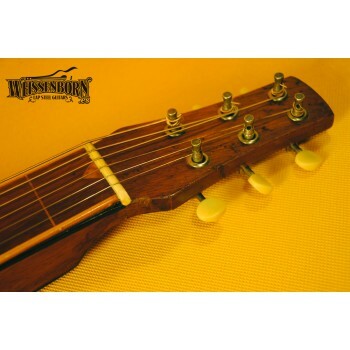 Headstock also has a characteristic shape more based in a Knutsen than what later Weissenborn developed (its only 1/2 inch thick resulting in tall appearance for tuning posts). Most of these pre-production "not" style 2 were built with spruce top and koa back and sides, while this is all koa wood. 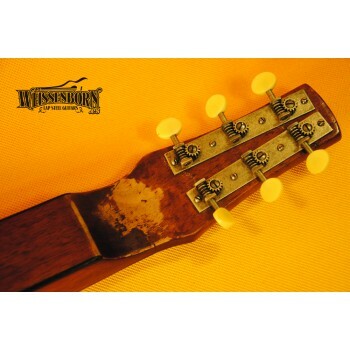 In fact, if you take a close look at the Hermann Weissenborn labels of this pre-production era, you will notice Hermann Weissenborn holds this same model of guitar (look at headstock and "fretboard"). While it is arguable wich of the Weissenborns sound better, deeper bodies or this ones, the fact is that pre-production models have a high collectible value; While Hermann Weissenborn supervised and selected woods in production era from 1923 to 1936, it is believed that all pre-production era instruments were built by his own hands. Also, it is obvious that a much smaller number of these instruments remain against production ones, because shop wasn´t yet established in a more industrious way and also, because these pieces were produced in a shorter period of time (only 2 years). The guitar remains in very good shape for its age. Luckily, has kept its original hard case. Has minor cracks in a side wich dont affect its integrity at all. Overall, it has still a solid feeling. Tuners original and working fine (pins and end pin will be soon replaced by Tony Francis´s reproduction hardware, as they have been replaced sometime in its 90 years), guitar keeps tune perfectly and plays great. Wood has some dark aereas on top at lower bout than can be seen in pictures that are absolutely gorgeous.